Our green energy products are helping to build a gentler, environment-friendly future for the earth. Conscious of the fact that we live in a world that is in "environmental crisis," we are taking our own initiatives to reduce our environmental footprint. To contribute to the resolution of the increasingly serious problem of waste disposal in major cities, we promote the reduction and recycling of all forms of waste. We strive to protect the environment by promoting energy and resource efficiency through our rational and efficient business activities. As a company that deals in batteries, a form of green energy, we seek to market products that take heed of the environment. We are also proactive in the recovery and recycling of batteries, and work towards the harmonization of our battery business and environment. We abide by the laws and regulations relating to the environment as well as other requests and demands agreed upon by environmental organizations, and contribute to environmental activities in local communities. We recognize the need to notify our employees of our environmental policies and to have a system whereby each employee is made aware of such policies. We regularly and systematically provide environmental education. We promote environmental policies with a sense of purpose and a determination to achieve goals. We also prevent pollution and achieve continuous improvement by carrying out regular reviews of the targets and goals that we set. We recognize environmental conservation as an important social issue, and implement the following policy with regard to products that we supply to our customers. We ascertain the amounts of chemical substances contained in our products, and guarantee to supply products that conform to the relevant laws and regulations and to the standards of our customers. We strive to raise the awareness of our employees regarding the impacts of chemical substances on the environment, and to reduce the amounts of chemical substances in our products that may affect the environment. We establish systems with our suppliers and customers to bring about actions that reduce the chemical substances contained in our products. the company group manage the outcomes of these actions, and establish, maintain and drive continuous and durable management systems for this purpose. We have established and are applying an Environmental Management System conforming to the international standard ISO14001. This Environmental Management System utilizes a PDCA (plan-do-check-act) cycle to bring about continual improvement. 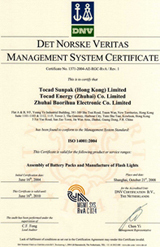 Copyright TOCAD ENERGY(HONG KONG) LTD. all rights reserved.